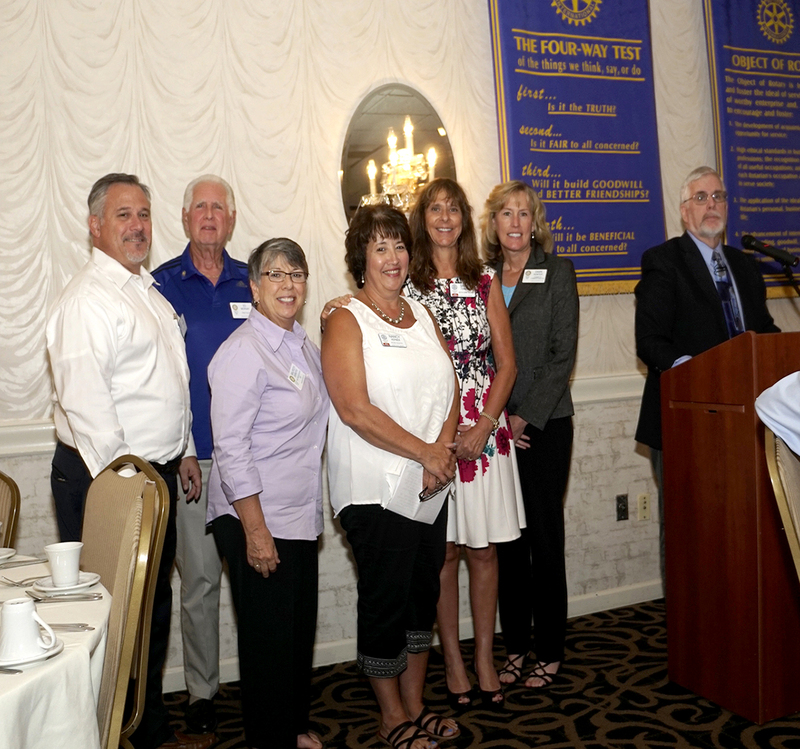 (Left to Right) New Vineland Rotary Club member Al Fisher, his sponsor Ed Morvay, Maureen Simmons who sponsored new member Nancy Hepner, new member Sandy Forosisky, her sponsor Dawn Hunter, and past president Ed Duffy, who officiated the new member induction ceremony last month. PHOTO: JAY PARKS. Vineland, NJ – The Rotary Club of Vineland continues to add active and civically engaged members to its rolls. At a recent membership luncheon, held at the Ramada of Vineland, returning member Al Fisher and new members Nancy Hepner and Sandy Forosisky were installed. With more than 80 members, the Vineland Club is the second largest in Rotary District 7640, which encompasses southern New Jersey. Rotary Membership Director Ed Morvay sponsored Fisher, who is Chief Executive Officer for Rural Development Corporation/Cumberland Family Shelter/Southern Regional Food Distribution Center. Rotarian Maureen Simmons sponsored Hepner, who retired in April as a teacher with the Vineland Public Schools. Forosisky, the City of Vineland Economic Development Director, was sponsored by Rotarian Dawn Hunter, who is Executive Director of the Greater Vineland Chamber of Commerce. The ceremony was officiated by Vineland Rotary President Ken Dondero, who noted that Rotarians provide humanitarian service, encourage high ethical standards in all vocations, and help build goodwill and peace in the world. As signified by the motto “Service Above Self,” Rotary’s main objective is service in both the workplace and the community. Posted September 17, 2017 & filed under Rotary News.